The BMW 120i has been designed with the enthusiastic driver in mind. Driving dynamics are enhanced by having stability and traction control as standard on all BMW 120i versions. The BMW 120i comes in 4 styles. And each variation comes with the same 4 cylinder DOHC 2 litre engine offering 115 kW, and 200Nm of torque at 3600 rpm. The engine is fired up by a push-button which is quirky and fun to use. There are three door and five door versions available that can either be driven through a six-speed manual or automatic gear box. The BMW120i is a capable little performer that can genuinely reach 215 km/h. At high speeds, the engine still remains sweet and highly refined. All this squirt under the right foot doesn’t mean that the 320i will flush your wallet out. On average, the BMW120i should still return you 40 mpg. Although the base model is a fairly well equipped car, if you want some of the extra luxuries like leather seats and satellite navigation then the more lavishly apparelled BMW 120i ES versions might be what you are after. The BMW 120i has a firmer ride than the cheaper BMW 116i and 118i cars. This is purely because BMW wants the driver to enjoy an entertaining drive. The BMW 120i gives very precise steering and loads of grip. It can happily stick to the tarmac when driven demandingly, and is very happy at being flung into corners at speed. This is helped by having the rear wheel drive set-up which BMW thankfully have held onto. Other front wheel drive competitors will struggle to keep pace with this little gem in the tight stuff. Sitting in the sculptured front seats gives you comfort and loads of support so that when driving the BMW 120i with verve, you are held nicely in place. To look at the seats are voluptuous and offer an open invitation to sit in them. However, rear legroom is a little on the tight side. 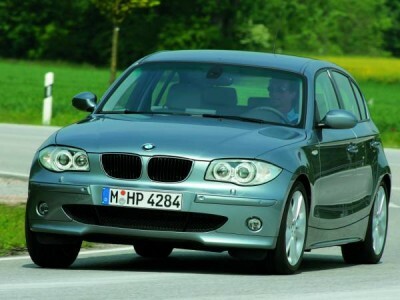 The little BMW 120i is a safe car and holds a 5 star safety rating. It is at the cutting edge of safety technology and therefore keeps the occupants as safe as is possible in the event of an accident. There are hints of the sporty BMW Z4 and Z8 in the BMW 120i design. This small car can turn heads at the lights, particularly if you opt for the Motor Sport version which is kitted out with the Motor Sport aerodynamic body kit, 3 spoke steering wheel and suspension. This all looks fantastic with the wider tyres fitted on the BMW 120i M version. Everything about the new BMW 120i should appeal to those who aspire to owning the BMW brand. Yes, it is a small Beemer; however, it holds all the class that its bigger 3 and 5 series cousins are full of. And yet it is a great deal cheaper. Keep your eyes out for the convertible version. This is a little beauty! For any more information on the BMW 120i, or for that matter any other new car, contact one of our friendly consultants on 1300 303 181. If you’d like some fleet discount pricing (yes even for private buyers! ), we can submit vehicle quote requests out to our national network of BMW dealers and come back with pricing within 24 hours. Private Fleet – car buying made easy!